The Dexcom G5® Continuous Glucose Monitoring (CGM) System provides real-time glucose readings for patients with type 1 or type 2 diabetes every five minutes. 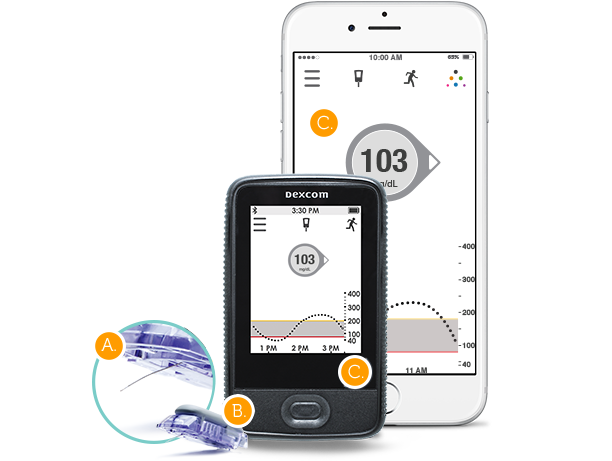 With Dexcom G5 Mobile, dynamic glucose data can be accessed and shared safely and conveniently anywhere, anytime to your smart device.† The Dexcom G5 Mobile - the first CGM system approved for adults and pediatric patients two years of age and older. *Dexcom CGM-based treatment requires fingersticks for calibration; may result in hypoglycemia if calibration not performed or symptoms/expectations do not match CGM readings. The Dexcom G5 Mobile App - available on Android devices! The Dexcom G5 Mobile is a compact CGM System that works seamlessly to display real-time glucose activity on the display device of your choice, giving you greater convenience and discretion to manage your glucose on the go. Check out the system for yourself. A discrete sensor located just underneath the skin, measures your glucose levels. Glucose data is sent wirelessly to either your compatible smart device or your receiver via Bluetooth® wireless technology. Your glucose levels are shown in vivid colors so you can easily see when your glucose is trending high, low or just right. The display device can be either a compatible smart device with the Dexcom G5 Mobile app OR the Dexcom G5 Mobile Receiver. With the Dexcom G5 Mobile app, you'll have the world's first CGM system on your compatible smart device.† You can view your real-time glucose data and trends right on your smart device, with the option to share your data with loved ones and caregivers. The Dexcom G5 Mobile CGM System sends immediate alerts to your compatible smart device or receiver when your glucose is trending too high or too low. Alerts can also be customized so they appear as text messages for additional discretion and privacy. With the latest update the Dexcom G5 Mobile App offers customizable Dexcom audio alerts with Mute Override and Vibrate-Only sound options so you never miss another Dexcom G5 Mobile glucose alert. 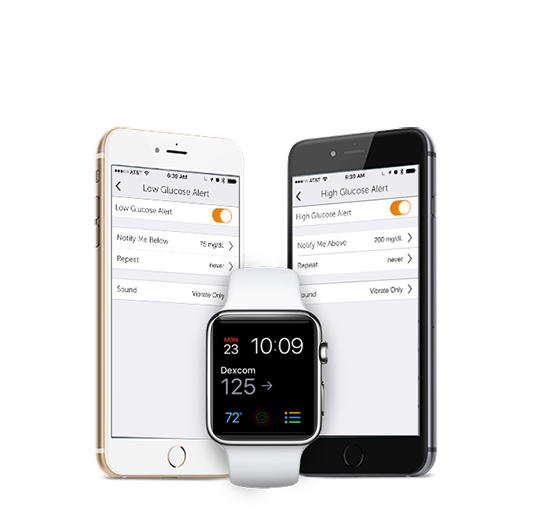 The Dexcom G5 Mobile App also includes enhanced Apple Watch features. With the built-in Dexcom Share feature in the Dexcom G5 Mobile app, you can choose to send your CGM data to up to five followers‡ on their compatible smart devices, so they can help manage your diabetes. 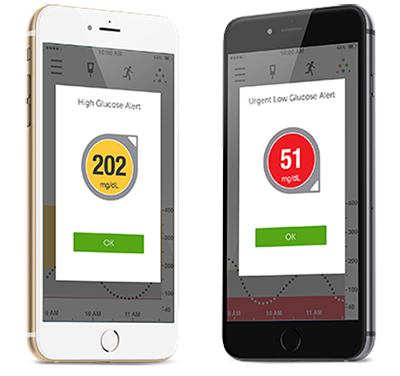 The Dexcom G5 Mobile app with the built-in Share feature lets you view and share your real-time glucose data and trends. Up to five people can remotely monitor your glucose data and trends on their iOS or Android-enabled device† at any time by using the Dexcom Follow app. Looking for more information about the Dexcom G5 Mobile System? Browse through our frequently asked questions (FAQ) to find answers. Why did I receive two transmitters? You have received two Dexcom G5 Mobile transmitters to support a six month supply. Each transmitter will last three months. Please only use ONE transmitter to get started. Do not remove the second transmitter from the box until it is ready to be used. Once you see the transmitter “Low Battery” screen, replace the transmitter as soon as possible. Your transmitter battery may drain as quickly as one week after this alert appears. Is the Dexcom G5 Mobile available for children? Yes, the Dexcom G5 Mobile is approved for both adults and children (age 2 years and older). How long does the Dexcom G5 Mobile transmitter last? Your Dexcom G5 Mobile transmitter is covered under a limited warranty for three months, starting from the first day it is used. The transmitter is warrantied to be free from defects in material and workmanship under normal use. For additional information, please refer to either the Warranty card that was included in the shipment box or the user’s guide. What is the difference between the Dexcom G5 Mobile system and the Dexcom G4 PLATINUM Receiver with Share™? The primary difference between the two systems is that with the Dexcom G5 Mobile, your glucose data can now be sent directly to your smart device, independent of your Dexcom receiver. This is possible because the Bluetooth® technology that transmits glucose data is now housed within the G5 Mobile transmitter, not the receiver, as it was in the Dexcom G4 PLATINUM system. You have more flexibility with the G5 Mobile system because you can monitor your glucose data on your smart device (through the Dexcom G5 Mobile app) without carrying the receiver with you. † A smart device is not included with the Dexcom G5 Mobile CGM System. Click here for a list of compatible smart devices. ‡ Following requires the Dexcom Follow app. The Dexcom G5 Mobile Continuous Glucose Monitoring (CGM) System ("G5") is a glucose monitoring system indicated for the management of diabetes in persons age 2 years and older. The G5 is designed to replace fingerstick blood glucose testing for diabetes treatment decisions. The G5 also aids in the detection of episodes of hyperglycemia and hypoglycemia. The G5 is intended for single patient use and requires a prescription. CONTRAINDICATIONS Do not rely on the G5 CGM data if you have recently taken acetaminophen. Remove the G5 (sensor, transmitter, and receiver) before Magnetic Resonance Imaging (MRI), Computed Tomography (CT) scan, or high-frequency electrical heat (diathermy) treatment. The G5 is MR Unsafe. Do not bring any portion of the G5 into the MRI environment. WARNING CGM-based diabetes treatment decisions are only approved with the G5, not previous generations of Dexcom CGM systems. Calibrate at least once every 12 hours using a fingerstick. If your G5 does not display a sensor glucose reading and an arrow, or if you are getting inaccurate or inconsistent readings, take a fingerstick. If your glucose readings and alerts do not match your symptoms or expectations, take a fingerstick to confirm. Failure to do so may lead to hyperglycemia or hypoglycemia. The G5 is not approved for use in pregnant women, persons on dialysis or critically ill persons. If a sensor breaks and no portion of it is visible above the skin, do not attempt to remove it. Seek professional medical help if you have infection or inflammation on or near the sensor insertion point. Report broken sensors to Dexcom Technical Support. Sensor placement is not approved for sites other than under the skin of the belly (ages 2 years and older) or upper buttocks (ages 2-17 years). To “share” data, you need an internet connection and a separate compatible smart device running the Dexcom Follow App. Contact Dexcom Toll Free at 877-339-2664 or www.dexcom.com for detailed indications for use and safety information.